Although LinkedIn released the Lead Gen Form format in 2017, many companies are yet to crack the code for success. Filling out a web form is tedious and cumbersome – especially when done on mobile. For this reason, LinkedIn has joined the Facebook train and launched Lead Gen Forms, which make it extremely quick and effortless to submit contact details in order to download a piece of content, register to an event, etc. 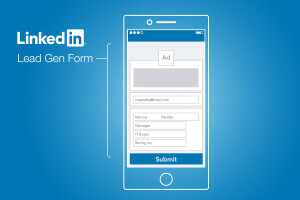 Available on both mobile and desktop, LinkedIn Lead Gen Forms can be used for Sponsored Content or Sponsored InMail campaigns. LinkedIn Lead Gen Forms have created a win-win solution for companies and prospects alike; companies can acquire lead data that is both accurate and up to date – and do so at scale. They can save time on building landing pages as Lead Gen Forms are a much faster alternative. Prospects can instantaneously acquire valuable information without the hassle of submitting their details manually or waiting for a page to load. When someone taps on the call-to-action button on your Sponsored Content campaign, a form will open up. From our experience, the form headline and description are no less important than the ad copy – if anything, they trigger people to take the extra step and complete the form. The copy should be descriptive yet concise. Tell viewers, one last time, what they can expect to gain for submitting their information. If your click-through rates are high (meaning, the ad is visually compelling and the messaging resonates with readers) but your form completions are significantly low, it could be that you have too many form fields. Even if your marketing team is hungry for more lead data, having more than 4 form fields can overwhelm members and result in fewer conversions. Stay within the boundaries of 3 to 4 fields because obtaining less contact information is better than having fewer leads in your database. The real power of LinkedIn Lead Gen Forms lies in their auto-completion feature. Requesting people to manually type in their information will take away from the time-saving goodness. To be in the safe zone and increase your conversion rates, choose fields that are likely to be listed on a user’s profile – things like full name, job title, company name, and industry – and avoid information that’s not listed such as a phone number. Thank You Pages – Make Them Work For You! There is never a wrong time to use good manners, especially to someone giving you the chance to sell your product. Although LinkedIn is encouraging users to stay on its platform by providing in-app form fills, it’s also providing an opportunity for a double conversion. As soon as users complete the form and hit the submit button, they’ll be greeted with a final “thank you” message and have the option to hit the “Visit Website” button. By this point, you’ll already have their contact information so what you can do is prompt further learning – or better yet, a second conversion. Need some help setting up a Lead Gen form, or even a new LinkedIn marketing campaign? Get in touch with us today!